LHV Garage Doors & Gates have sourced the best motors, at the lowest prices, that offer superior performance, for the longest possible period. Quality in function, durability and performance is key to enjoying a long-lasting, trouble-free, noise-free motor. Various motors are available on the market, but many have not been tried and tested over a certain period of time, it is for this reason that LHV Garage Doors & Gates only chooses to install automations that have proven themselves and have been available, for many years. It is also essential that the parts are readily and cheaply available for the automations, so that if any damage does occur to the motor, it can be easily repaired for a reasonable amount, as opposed to having to get an entire nee motor because the parts are not available or are simply too expensive to replace. Clients should also take note, that many of the older motors available in Western Cape have been discontinued, making repairs virtually impossible. All sliding gate automations come standard with 2 four-button remotes and 4 meters of nylon rack, on a galvanised steel angle, needed for the motor gear to run up and down the sliding gate. 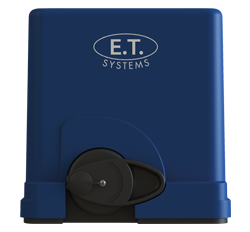 A heavy-duty security bracket is available to purchase for all the ET sliding gate motors. LHV recommends installing this due to the increase in gate motor theft over the past few years. As an extra security precaution, LHV Garage Doors & Gates always welds the base plate of the sliding gate motors to the client’s track, making it harder to remove. We also add anti lift brackets onto the client’s gate, to prevent someone from simply lifting the gate off the motor gear. 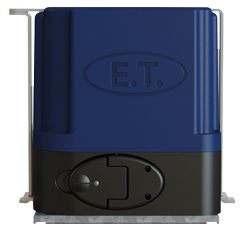 The ET 500 Drive motor is an excellent automation, that is the upgrade to the ET 500 DC motor. This motor is for a sliding gate and is capable of operating a gate up to 500 kg. It has battery back-up, allowing you to operate the motor during power failures. It is important to note that this motor is reliant on the battery in order to function. The battery will need to be replaced every 2 to 3 years, as it is a sealed consumable unit. The automation has been upgraded from the first original model, but the important point is that the motor has remained virtually the same and all its parts are available straight from the supplier, and all the new upgraded parts can be fitted to the original ET 500 DC models. This motor has a slow stop and slow start function that ensures that the gate does not slam open or closed that will prolong the life of your gate and motor. It is for those reasons, that LHV Garage Doors & Gates recommends, all ET gate automations, to all its customers. The ET 500 DC is an excellent automation that has been on the market for over 8 years. This motor is for a sliding gate, and comes standard with 2 remotes and 4 meters of nylon rack, on a galvanised steel angle, needed for the motor cog to run up and down the gate. The automation has been upgraded from the first original model, but the important point is that the motor has remained virtually the same and all the parts are available straight from the supplier, without any waiting period, and all the new upgraded parts can be fitted to the original models. This motor has a slow stop slow start function that ensures that the door does not slam open or closed that will prolong the life of the gate and motor. It is for those reasons, that LHV garage doors recommends, all ET gate automations, to all its customers. As the motor is AC/DC, it has true battery back-up, which means that the motor can run completely independently of the battery, as opposed to the DC motor. The ET 600 Drive is commonly used on complexes and commercial sites, where the gate is in operation for most of the day and opens more than 10 times a day. This motor is for a sliding gate and is capable of operating a gate up to 500 kg. This motor was introduced into the market, to accommodate light domestic gates. This motor is for a sliding gate and can handle a gate of up to 300 kg. It has battery back-up, allowing you to operate the motor during power failures, however, it is reliant on the battery to function. This is a 24 volt unit. The motor is very quiet and takes up less space than the ET 500 gate motor. It has the same standard features as the ET 500. The Wingo motors are used for swing gates. These motors can only be installed onto swing gates, where each leaf of the gates is less than 3m wide. The gates should have gaps between the wood, steel or whatever material is used to make up the swing gates, to allow wind to pass through easily, so that the gates are not forcefully blown out of position. The Wingo motors have a 24 volt battery back-up system, and are reliant on the battery to operate.